We think the seaside city could be the next popular digital nomad hotspot. It’s already getting a lot of hype. Da Nang has many big city amenities, without feeling too big or crowded (by Vietnamese standards) or too “discovered.” We loved that we could escape the city easily via miles of beautiful coastline and dreamy beaches or hop on a scooter and head to the Son Tra Peninsula for green forests, pristine beaches, and monkey friends. We were so impressed with the city, we’ve vowed to return for another stint next time we are in Asia. Da Nang has a tropical climate; temperature highs range from 75-95 degrees F and lows average 65 to 75F. The warmest month is August and the coolest January, and October and November are the wettest months. We visited August thru October and found the weather to be warm and sunny, but generally agreeable. You will want to ensure you have an AC in your rental bedroom. Though we feel the gorgeous beach nearby makes the warm weather tolerable. Like anywhere in Vietnam, there are enough restaurants, cafes and street vendors to keep you busy and well-fed for a lifetime. Vietnam is a cheap foodies paradise. Definitely come in with an open mind and I promise you’ll find new favorite foods you didn’t even know existed. We think Vietnamese food is truly spectacular however we lived in the country for nearly 2 years before we really began to understand it. To the new-comer with a language barrier, it can seem intimidating. If you are new to Vietnamese food I highly recommend taking a food tour or two with a local company to help introduce you. TIP: An all you can eat dinner at Ngon Villa is good introduction to Vietnamese food. Here for a flat fee you can order anything off their menu, which features loads of Vietnamese, specifically Central Vietnam, specialties. It’s one of the best ways to quickly familiarize yourself with the local cuisine. We stayed in the popular My An neighborhood, where we were a 5 min walk from a long, glorious beach. Taking morning walks on the sunny sand was seriously the best way to start my day. While the waves can seem intimidating certain times of the year, I usually found it to be calm and beautiful during and just after sunrise and would often join locals and Korean tourists in the warm water. Waves mean a potential for surfing. Surf season in Da Nang is September to March. You can rent a board from one of many places in My An. Maybe you’ve always wanted to learn–join the surf school. Da Nang has an international airport which makes it a super convenient base. We flew in from Korea and took a weekend trip to Taipei while we were staying in Da Nang. Additionally, it’s cheap to fly elsewhere in Vietnam and Southeast Asia from Da Nang. Da Nang, along with the rest of Vietnam has a low cost of living. It’s not difficult to find a place to rent at any budget; there are great options in the $250-500USD/month range for a nice, private apartment. Food, especially local food is very inexpensive. We rarely spent more than $5 per person on a meal. Renting a motorbike will put you back $50-60USD/month. Nightlife can also be very inexpensive with local beer rarely surpassing $1-2 and cocktails averaging $3-4. Da Nang is home to several decent coworking spaces. We’ve found this is the best way to meet fellow nomads and get support when you arrive in a new city. We worked from Space A and dug its quiet, laid-back vibe. Enouvo Space comes highly recommend, however, we didn’t get a chance to check it out. And for those looking for an option on the other side of the river, check out SurfSpace. Depending on your style this may be a disadvantage, but we really enjoyed the laid back atmosphere. We stayed in the popular expat neighborhood of My An/An Thuong, located between the beach and the river. This area especially feels beachy and laid back and has a variety of Vietnamese restaurants along with Japanese, Indian and burger places. If we wanted to stay in and go to be early, it wasn’t a problem. If we felt up for a drink or two, we could always find an open bar or low-key spot for a beer. While the internet is completely dependent on where you decide to stay, we found the internet in Da Nang to generally be pretty decent. Our apartment had a 50mbp connection. This worked well most of the time, however, I would often use an ethernet cable for important video calls or when teaching online classes. We worked from a few cafes successfully and when we wanted to get out of the house, we went to a nearby co-working space. On average the internet was not quite as good as Chiang Mai but significantly better than, say, Bali. Be aware of the random power outage, especially during rainy season. It was never a huge problem for us as our apartment had a generator and we had a backup data plan to use as a hotspot should we ever need it. There is no shortage of decent low budget options in Da Nang. Expect to spend USD$300-600/month on a one-bedroom apartment; USD$200-300/night on a private room or studio in a good location. This often also includes weekly cleaning. We found our apartment on a facebook group for Da Nang rentals; however airbnb has a multitude of options. Keep in mind many airbnb private apartments have a website or outside contact if you prefer to book directly with the manager. TIP: Join one or more of the many Da Nang facebook groups such as “Digital Nomads in Da Nang” or “Apartments, House, Villa Rental Da Nang- Hoi An” and post an inquiry about what you’re looking for. You are guaranteed to receive at least a couple good offers as the rental industry is competitive. While you’ll definitely find a larger DN scene in Ubud, Medellin or Chiang Mai, Da Nang appears to be growing every day. We had no problem finding social gatherings or meeting fellow Nomads during our time in Da Nang. Search for groups on Facebook and join a few to learn about events. During our 2 month stay, we attended a weekly painting night at a local bar, a couple bi-monthly Digital Nomad meetups, a trash/litter cleanup group, and regular yoga classes. The bars and restaurants on the An Thoung side of town were most popular with the international crowd, additionally the streets on either side of the river are bustling with hip bars, coffee shops, restaurants, a microbrewery, and pedestrian walkways. Perhaps one of the best parts of staying in Da Nang is that it serves as an ideal base to explore other areas. If you’re up for it, we recommend hiring a scooter and exploring nearby natural and rural areas, driving to Hoi An for the day or driving to Hue via the famous (and spectacular) Hai Van Pass. Want to check out the Instagram-famous hand bridge and the wacky amusement where it resides–it’s on the outskirts of Da Nang. Plus, there’s an international airport and train station for when you want to leave the area. Manage your expectations; this is not yet a Chiang Mai or Ubud. But this fact alone may attract some people. Though there is a lot of untapped potential here, it’s not quite perfect. A lack of sidewalks makes walking or running a little inconvenient. Small number of Western restaurants (we didn’t mind!) means picky eaters may struggle. Language/cultural barrier makes communication a challenge–though I will say, we managed just fine. Could Da Nang be the next Digital Nomad hot spot? We think so! A growing group of Digital Nomads have already started trickling in, with many coming from nearby Chiang Mai, looking for something different or escaping burning season. To cater to this group, coworking spaces are popping up. Being a scenic seaside city, there is no shortage of brand new, luxury apartments for $300-600/month ave. 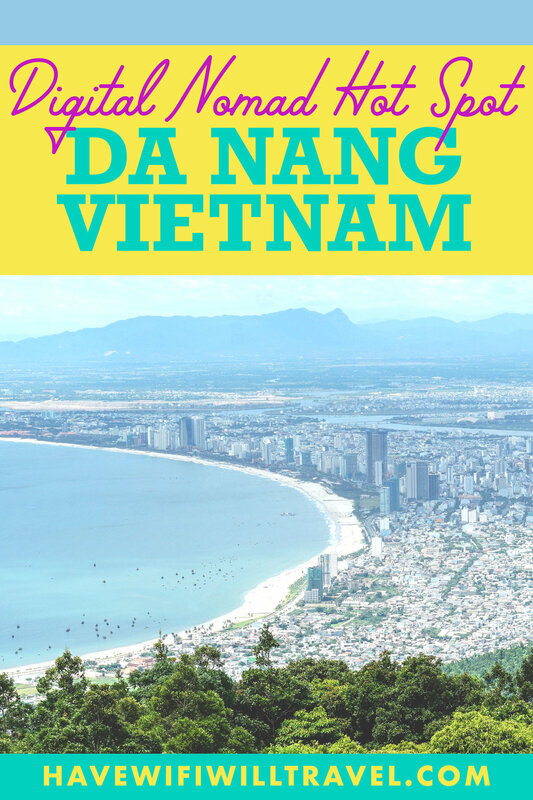 If you’re looking to spend some time in Southeast Asia, but want to try somewhere outside the typical digital nomad hotspots, you might consider giving Da Nang a try. Do we have you convinced on Da Nang?